On Monday afternoon, Xenia and Vanessa found themselve looking up at the front of an ugly building, just as the sun disappeared behind a cloud. It was the main entrance to the Woolcroft Center, and as they stood transfixed, a clock in the tower gloomily began tolling the hour. “Ugh,” Vanessa remarked. She couldn’t quite think of what else to say. Noah was right, she thought. This place is creepy. Talking with Noah, Vanessa recounted a little of how much of an impression Swancall made on her. It didn’t make the same impression on him, apparently, since even hearing about it elicited a gag response. (What are you going to do with brothers?) But Noah has an even stronger response to hearing about The Woolcroft Center, where some of the movie was filmed. He remembers it from field trips he has gone on as being creepy. When Vanessa and Xenia go to visit on Monday, she agrees with him. Sometimes getting research photos for the drawings was hard. This one wasn’t. 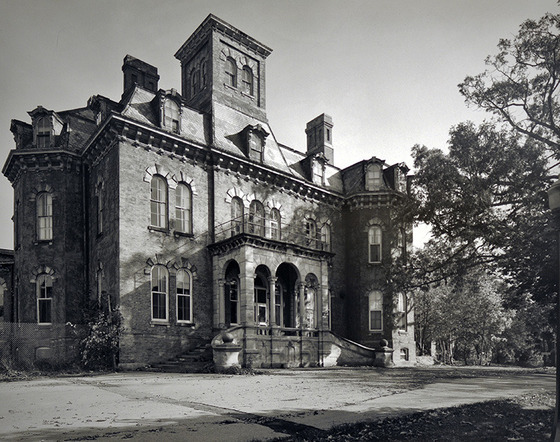 When I Googled “creepy mental institution,” this image of the Willard Asylum in New York caught my eye. Perfect! Well, what can you expect from an old mental institution? These old buildings tend to sum up all that is worst about the look and feel of decrepit institutional architecture. At the same time grandiose and sterile, imposing and frightening. Or is that just how they strike us because we know what the building was really for, and how much anguish, dysfunction and misery was contained there? Places like that strike me in the same way as old battlefields or historic landmarks from something terrible: You can almost feel the human imprint of what happened there. I’m not into paranormal stuff. I don’t believe in ghosts. But I do believe there is some mystery to that “human imprint.” It doesn’t mean that dead people are moving furniture around or trying to take out their frustrations on the living (much as that makes for a good script). But to me it does just kind of change the way you feel being there. 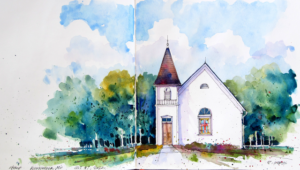 The little church that inspired my stone chapel at Woolcroft was beautifully captured in watercolor by James Nutt at the Urban Sketchers Midwest blog. That’s the kind of thing I was trying to evoke in chapter 19. There are two places I had in mind: an old Confederate soldiers’ home in rural Higginsville, Missouri, and the Glore Psychiatric Museum in St. Joseph. The first was a side trip I went on and the grounds were just a lovely old echo from the past. 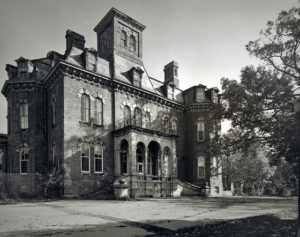 These kinds of campuses used to be around more — just the 19th century public’s way of giving wounded Civil War veterans a place to live out their days. The one in Higginsville was 365 acres and at one time fed and housed 1,600 vets and their families. 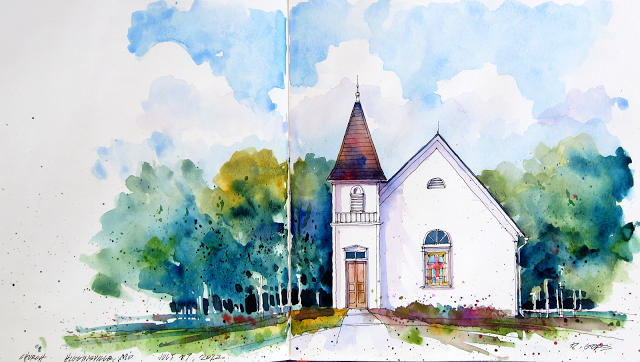 Many of the buildings are no longer there, but the small chapel made an impression on me. In Vanessa the Wonder-worker, that became the little chapel — which I never gave a name to, by the way — that was the one bright spot in the otherwise bleak environs of Woolcroft. It would be, I imagined, a place that somehow held onto a feeling of sanctuary and hope — a place where the human imprint was just as bright as the rest of Woolcroft was dark. A good place. 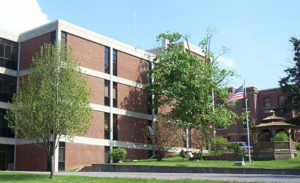 As for the Glore museum, it is housed in the exceedingly drab-looking Northwest Missouri Psychiatric Rehabilitation center in St. Joe. 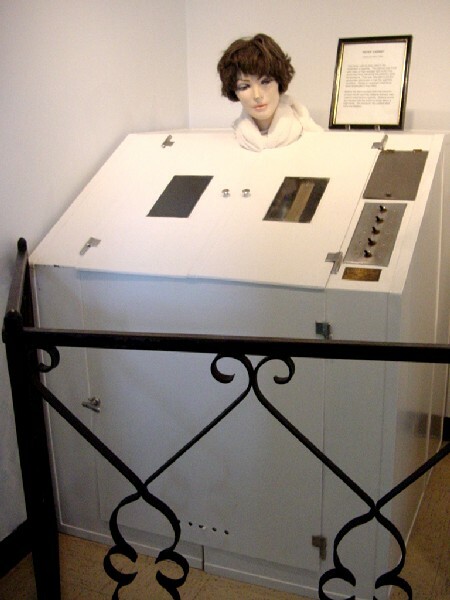 Besides just taking you through some of the old treatment rooms and clinics from the center’s past, there are exhibits that represent treatments — and, quite literally, punishments — used on insane people throughout history. A fever cabinet from the Glore Museum, from the days when someone thought that you could sweat a person out of a mental breakdown. As you would imagine, it’s not a pretty picture, especially when many of the contraptions feature old mannequins, with their vacant expressions of weird glamor. George Glore, who worked on these displays for decades, was an employee of the state’s mental health department. He thought that showing the “atrocities of the past” would show how much progress had been made. I don’t know how successful he was with that. When I visited, my sad takeaway was that our methods are definitely more humane, but the simple fact is that we still just don’t know what to do with mentally ill people. With them, for them, about them. We can treat a lot of symptoms if we get the meds right, but there still seems like a lot we don’t know. And in the ’80s and ’90s, we began treating more and more people with medications and closing the institutions. The mentally ill people didn’t disappear — the public just didn’t want to keep funding big facilities that no longer held any promise. That is also something that will become part of our narrative, down the road. But for now, we don’t need to consider any more of that sad picture. My fictional Woolcroft Center is a generally gloomy place with one bright spot — the stone chapel by the lilypond. But there is also a certain mystery for Xenia and Vanessa to try to make out, in the mobile office of Unit 6B where James works. From the conversation they have with Caroline Sharp, the rather shiny-faced president of the Woolcroft Foundation, they discover that the snow geese housed in the enclosure will play a part in the Angel Wings festival coming up. The idea is to let the festival-goers do their big traditional sing-along of the final number to the three geese, just as the people in Swancall sang for the swans in that big finale. It is, as Vanessa thinks privately, a weird idea. But she and Xenia are struck with how many coincidences are coming together. What does it all point to? Time to get the Club together and find out.